Volodymyr Zhemchuhov’s story is well-known throughout Ukraine. Ethnic Russian, who was born and lived in Donbas all his life. Former miner and entrepreneur, who became partisan after the war has started. In September 2015, Volodymyr Zhemchuhov was seriously injured and captured during a military operation at NGCA (Non-government controlled territory of Luhansk oblast. At first, he was sent to a local hospital, and then, being already blind and without both hands to Luhansk separatists’ pre-trial detention centre. He was released from captivity a year later, and was treated in Germany under the agreement between the Ukrainian and German governments. He obtained a rank of the Hero of Ukraine in January 2017. In November 2017, Volodymyr Zhemchuhov, as the Hero of Ukraine, and his wife received an apartment from the state in Kyiv. However, it proved to be a problem to privatize it. All citizens of Ukraine, including IDPs (internally displaced persons) from Luhansk and Donetsk oblasts, must provide information about their previous privatization history for the whole period since 1992 in order to own the property provided by the state. Such information may be provided by regional departments of the State Property Fund of Ukraine or Oschadbank. However, in the case of IDPs, it is almost impossible to get these documents, because the archives remained in the occupied territory. 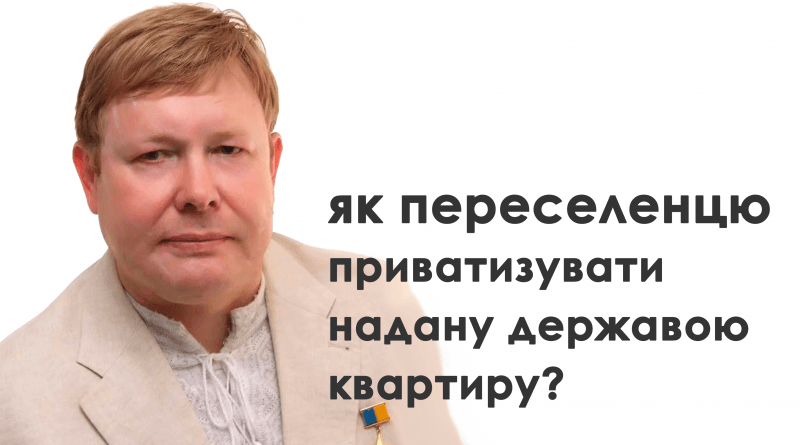 Zhemchuhov family decided to do a usual thing, as all citizens of Ukraine do: at first, to appeal to the Privatization Department of the State Housing Fund in the Darnytsky District Administration, where they were given a list of necessary documents. When they faced the problem with documents, they turned to the Ministry of Temporarily Occupied Territories and IDPs for help. Employees of the Ministry helped with the appeal to the central office of the Oschadbank and gave recommendations who else can be addressed on this issue. Zhemchuhov family received an official response from the Oschadbank that it is impossible to give the requested information because the documents were in the NGCA. Volodymyr and his wife sought assistance from several organizations and specialists, including Dmitry Korostelov, a lawyer, a Liaison Officer on IDP issues. Zhemchuhov family together with him wrote and sent official requests to several departments, including SDA (the State Department of affairs), asking to clarify the procedure for housing privatization for IDPs. Although the official response was negative (it was indicated that there was no privilege under the law in this case, as there was no special procedure), but the very fact of the appeal triggered a process that resulted in Zhemchuhov family’s entitlement to own the apartment. “After we had appealed, we were provided with the SDA specialist who was always with us and helped to solve the problem, and to collect the necessary documents. After we received necessary documents, the privatization department of the Darnytsia Regional State Administration was able to conduct work on privatization in accordance with the current legislation of Ukraine. As a result, we received ownership documents. We are grateful to everyone who assisted us in this process. I hope that our government will be able to prescribe a mechanism in a single document of the Ukrainian legislation to resolve such issue for IDPs. It is very important for them to feel that the state cares about them”, – Olena Zhemchuhova, Volodymyr’s wife. The Volodymyr Zhemchuhov’s case showed the problem that IDPs face when they want to own housing provided by the state. This problem, as well as the problems with pension provision, and voting rights requires a legal response. “We are glad that the Hero of Ukraine Volodymyr Zhemchuhov got possession of the apartment. But the problem is acute for other citizens from NGCA, who try to privatize housing provided by the state. Well, not just for them. People, who lost their documents or access to them because of the war and occupation, can not inherit, adopt a child, and face other common problems. The state should launch a mechanism for legal response of this issue instead of solving some individual, potentially scandalous cases”, – said Dmitry Korostelov, Liaison Officer on IDP issues at the national level. Liaison Officer on IDP issues, while working in the regions, recorded appeals and complaints from residents and IDPs on health services and medical provision. The challenge to access health services and medical provision overlap with the problems to receive pensions, creating a serious problem for hundred thousands of citizens. According to experts of the Liaison Officer (RADNYK) Programme, about 200,000 IDPs monthly face blocking of their pension payments for various causes. A vivid example of such discrimination was the Ihor Kozlovsky’s case. He is a scholar from Donetsk, and spent two years in captivity. After his liberation, he got an IDP status. Kozlovsky got his pension suspended because he traveled abroad to meet European high rank officials. Although the problem was quickly resolved, because of the interference of Ukrainian human rights defenders and politicians, it remains acute for hundred thousands of Ukrainian citizens.